This DIY project is about a handmade turquoise bead bracelet. It's very easy to make. 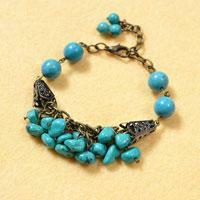 Just give it a try if you like this turquoise bead bracelet. 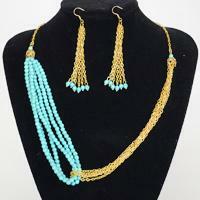 This is a detailed instruction on making a chain and wire wrapped statement necklace and earrings set. Just move on to the steps below. Today, I'll share a unique type of turquoise body jewelry with you. It's easy, quick and inexpensive to DIY this body jewelry. Just have a try if you like it. If you are searching for simple but beautiful necklace, you can check this tutorial on make double gold chain necklace with heart turquoise beads. 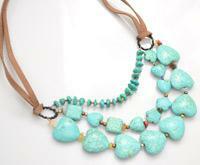 Are you looking for turquoise necklace design? Here I’d like to show you a turquoise and black necklace. 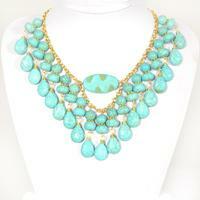 I believe you will like this beautiful turquoise necklace. 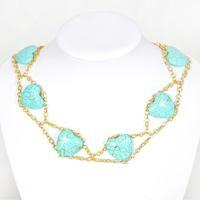 This is a turquoise choker necklace with golden chain tutorial. 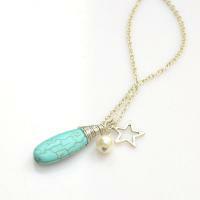 If you like turquoise chain jewelry pattern, just look at here. 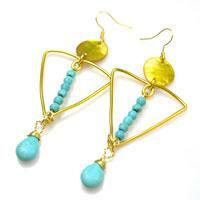 This tutorial will show you how to make big gold triangle earrings with wire and turquoise beads. The result will be fab, don’t go away! 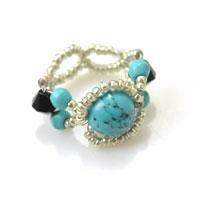 Want to make handmade turquoise rings? In today’s beading tutorial, I will show you how to make beaded rings with wire. Hope you will like it! 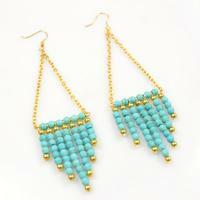 This is a couple of turquoise statement earrings, if you want to diy statement earrings, you can follow me. It’s a simple tutorial to diy bow necklace, turquoise beads are favored by many people, so I am sure this bow pendant necklace will give you a big surprise. 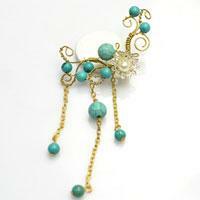 Learn how to make wire wrapped flower ear cuff earrings with turquoise beads and chains. I’m sure you will be surprised by the jewelry. This tutorial is going to show you how to make a multi-colored cuff bracelet with turquoise, acrylic, silvery and wood beads in Boho style. Here is displayed a 2-step project about making an adjustable bracelet with turquoise and pearl beads. Hope you like it! This tutorial is to display you how to make a multi strand necklace with multiple turquoise beads and colorful quartz and seed beads. 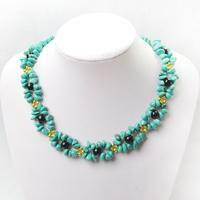 I’d like to show you a cool diagonal striped pattern made of turquoise beads and white glass pearls. 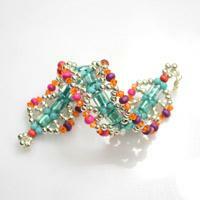 Click here to learn the details about making this pretty bracelet pattern. 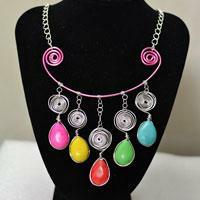 This tutorial is to show you how to make beaded necklaces pattern. 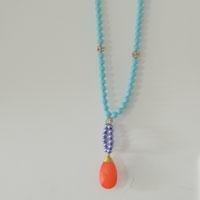 You can design your own long turquoise bead necklace with our course. 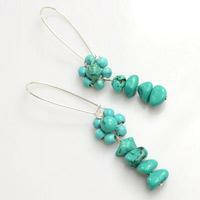 How to make the wire wrapped earrings with turquoise? This tutorial will show you the details about making the wire beaded earrings. 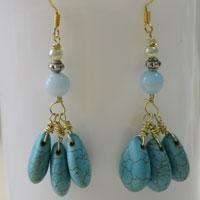 How to make dangling flower earring design with turquoise beads? This tutorial will show you the details about making the beaded flower earrings.